Product prices and availability are accurate as of 2019-04-14 17:43:56 EDT and are subject to change. Any price and availability information displayed on http://www.amazon.com/ at the time of purchase will apply to the purchase of this product. 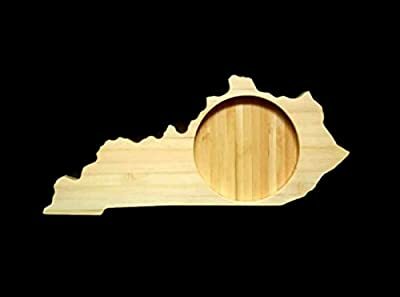 Get your own state or country shaped coaster in bamboo! Show pride and love for your home or favorite place to travel! These coasters are also superb gifts for out-of state family, visitors, friends and weddings! Love to travel/want unique memorabilia? Ask for a set of four DIFFERENT destinations and celebrate your favorite places to go! Please read carefully before buying: *Production Time: All of our sets are custom made just for you! Our standard production time of 1 week applies. However, we always strive to get them to you ASAP! 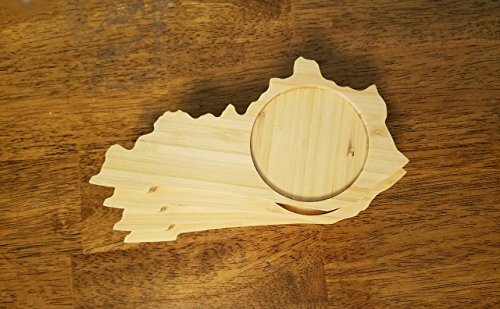 *Approximate dimensions: Material Thickness: (1/2") Cup holes if ordered (3.25") But the beauty of our country is no state is the same! Each coaster's height and width vary with each state's border, and whether cup holes are present. *Adjoining states do not interlock* *What's great about bamboo? These coasters are made with beautiful bamboo. Did you know that bamboo is the fastest growing plant in the WORLD? And, it's harder and more durable than other hardwoods, meaning your coasters will last longer! They are finished with a coat of conditioner that make it convenient for drinks/condensation! Care is simple and easy- wipe with a wet cloth (wouldn't recommend washing/submerging).